This one came into the station a few months back and grabbed my attention immediately. Anything remotely connected to Pink Floyd is worth a listen in my opinion. About twenty years ago a record called Us and Them: Symphonic Pink Floyd which is an amazing interpretation of legendary, mind bending Pink Floyd, so that sparked high expectations here. 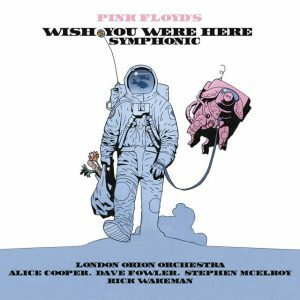 This particular release celebrates the 40th anniversary of the original 1975 Wish You Were Here. While the majority of this album is indeed orchestral, there are vocals. Alice Cooper lends himself to the title track, and “Welcome to the Machine” also features vocals. These tracks feel out of place, and upset the delicate balance of honoring a classic. Nevertheless, the pure symphonic compositions are excellent.